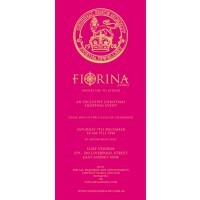 Fiorina Jewellery brings to Sydney, for one day only, an innovative and inspiring collection of iconic works. A brilliant opportunity for women to view the collection first – hand. Treat yourself and indulge in something special for this Christmas. Featuring a selection of limited and one off pieces, this event promises luxe accessories that will become staples in your wardrobe in years to come.